In the summer of 2010, the Free Church board of trustees set a goal to become a Welcoming Congregation. 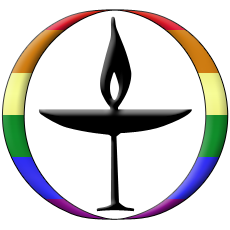 We wanted to be known as a church that affirms, welcomes, and celebrates lesbian, gay, bisexual, and transgender persons. Members were ready and willing to participate, and we began workshops in the fall of 2010. Along with the workshops, we have had Social Justice Sundays devoted to LGBTQ concerns, marched in Pride parades, purchased books and DVDs for our library, and announced in church/ posted to our bulletin board events and information relevant to the LGBTQ communities. On July 26, 2012, the UUA notified us that we are officially recognized as a Welcoming Congregation.